While the smaller, chic office spaces are preferred by quickly growing tech companies in NYC, the market for Sixth Avenue, large-scale space continues to shrink. WSJ asked CompStak's own research director, Noam Shahar, to comment. Manhattan's Sixth Avenue used to command some of the highest office rents in the city thanks to the appeal of its hulking towers to big-name companies like Exxon Mobil Corp. (XOM -0.83%), J.C. Penney Inc. (JCP -4.43%), and Time Warner Inc. (TWX -0.76%). 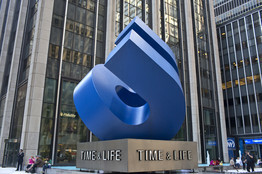 The Time & Life Building at 1271 Sixth Ave., where Sandow Media will pay 35% below market price. But these days Sixth Avenue is getting hit by a double-whammy. On one hand, expanding technology companies are the biggest source of growth in the office market and these companies favor older buildings and hip neighborhoods. On the other hand, Sixth Avenue has seen about a half-dozen big blocks of space come on the market from tenants moving, contracting or failing. 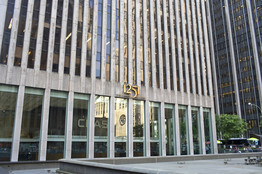 More than 780,000 square feet of office space is available for sublease along Sixth Avenue, according to real-estate information firm CoStar Group Inc.(CSGP +0.17%). The result: Rents on Sixth Avenue are anemic and vacancy is on the rise. That's good news for tenants looking for bargains, but worrisome for owners, especially for those who have made big investments in the area recently. "Large contingencies of sublease availability will, in general, drag down rents nearby," says Noam Shahar, research director at CompStak, a New York firm that tracks office leases. The strongest evidence of weak rents came recently with the efforts by AXA Equitable to sublease roughly 300,000 square feet in the 2-million-square-foot office tower at 1290 Sixth Ave. The financial-services giant, which was represented by Jones Lang LaSalle (JLL -1.32%) filled all the space by doing deals with tenants including Morgan Stanley (MS -2.09%), Sirius XM Radio (SIRI -0.61%), and Rémy Cointreau (RCO.FR -2.42%). But the rents those tenants are paying are in the mid-$40-a-square-foot range, according to CompStak. That's well below what AXA is paying in rent, $88 a square foot, according to statements made by the building's owner, Vornado Realty Trust (VNO +0.41%) earlier this year. Part of the reason for the wide disparity is simply that rents overall have fallen since 2007, when Vornado cut its rent deal with AXA. But broader market statistics also don't bode well for Sixth Avenue. Overall the "availability" rate in the Sixth Avenue-Rockefeller Center market increased to over 14% in the first quarter of 2013, up from just over 10% in the first quarter of 2012, according to CBRE Group Inc. (CBG -1.09%) That rate includes vacancy and space coming on the market in the next 12 months. Tenants that are benefiting from this trend include law firm Zeichner Ellman & Krause, which subleased 42,000 square feet at 1211 Sixth Ave. from Ropes & Gray. Zeichner Ellman is paying rent in the low-$50-a-square-foot range, well below the rent in the high-$60-a-square-foot range that Ropes & Gray is paying, according to CompStak. Three blocks to the north, at 1271 Sixth Ave., Sandow Media is subleasing 40,000 square feet of space for 35% below market price, according to Newmark Grubb Knight Frank, which brokered the deal. Meanwhile, in Midtown South, the neighborhood of choice for many technology companies, the picture is a lot different. In the first quarter, average rents increased 9%, passing the $60 threshold for the first time, according to CBRE. Tenants subleasing space might actually able to make money instead of suffer losses as they are in Midtown. Michael Plavin, a vice president of commercial real-estate firm Cresa, says the profit could be as much as $15 a square foot. Many of the towers along Sixth Avenue between 42nd and 57th streets were developed in the 1960s and 1970s during an era in which New York architects favored towers set back on spacious public plazas. The towers—which also included 1251 Sixth Ave. and 1301 Sixth Ave.—were filled with some of the country's largest corporations. Many of the original tenants along Sixth Avenue, including Exxon and J.C. Penney, moved out. While they were replaced by others, the architecture along Sixth fell into disfavor, with the towers seen as sterile and inimical to street life. Today city zoning rules discourage such towers from being built. To be sure, the value of office towers on Sixth Avenue today remains strong along with other trophy Manhattan properties. For example, Montreal-based Ivanhoe Cambridge Inc. and a partner recently agreed to purchase a 49% stake in 1211 Sixth Ave. in a deal that values the Manhattan office tower at about $1.75 billion, according to multiple real-estate executives with knowledge of the deal. The building is home to The Wall Street Journal and its parent News Corp (NWSA -1.25%), which occupies about half the building. But these high values are being driven primarily by investors seeking yields in a low-interest rate environment. Rents and occupancy rates in Manhattan are still far from pre-bust levels. 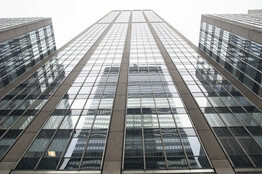 Some of the tenants recently departing the Sixth Avenue area include French bank Société Générale (GLE.FR +1.21%) which left the McGraw-Hill (MHFI -0.62%) building at 1221 Sixth Ave. for Park Avenue, vacating more than 500,000 square feet of space. Also, law firm Dewey & LeBoeuf vacated 470,000 square feet at 1301 Sixth Ave.—the old J.C. Penney headquarters building—after declaring bankruptcy. Large space availability on Sixth Avenue could spell trouble for developers like New York-based RXR Realty, which took a gamble when the company signed a 99-year lease for 75 Rockefeller Plaza. The 33-story tower will be completely empty in 2014. But the company's executive vice president, William Elder, is bullish about the market on Sixth Avenue, which he predicts will get tighter in the coming year. He points to the AXA Equitable subleases as a sign of strength because the company succeeded in finding tenants for all of its sublease space in a short of amount of time. "People jumped on the opportunity and that space is all gone," says Mr. Elder. "That's a good sign." A lot of the available space in the area "is not a bad thing," he adds. "It gives larger tenants choices to locate on a great avenue."